What a FUN day we have had today! It started out with PT this morning, where we learned a few new tricks to help Annabelle! 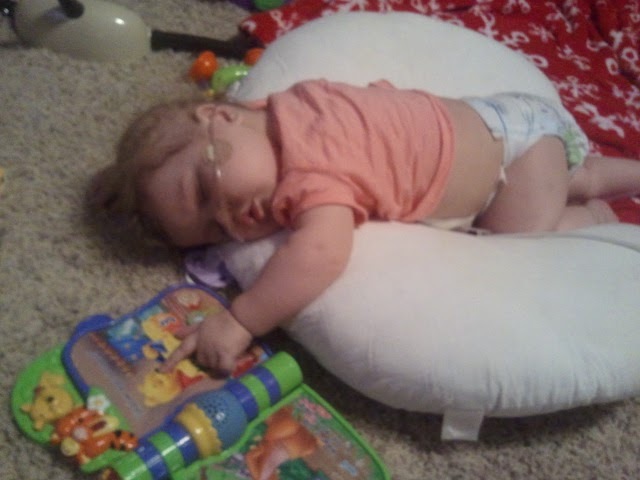 Our goal is to get her able to go from laying down to sitting up ALL BY HERSELF. This won’t happen overnight, but it is what we are working on! Annabelle got her FIRST TRIP TO THE MALL!!!! It is a right of passage for Phillips’ girls of course! And I figured on a Thursday in the middle of the day was a good time to take her. We were going with a PURPOSE too. On Monday, we are having her one year pictures taken (yes a little late!) by my cousin who does professional photography. We also saw another heart Momma there (her little one is in heaven with Jesus) so it was fun to get to talk to her and introduce her to Annabelle too! Then… we had ANOTHER first. 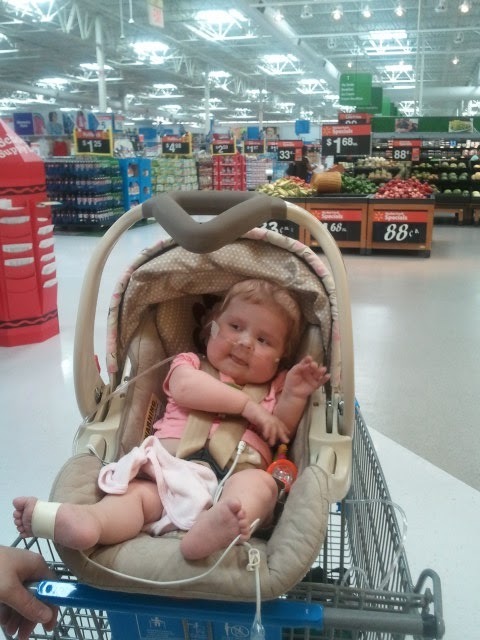 Annabelle’s first trip to WALMART!! 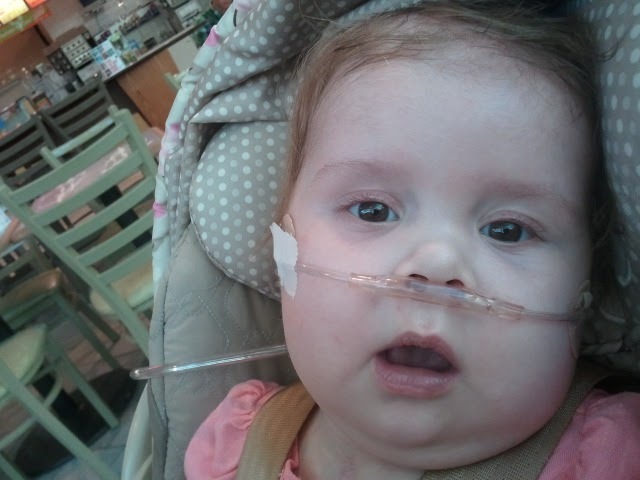 Annabelle’s picture has been up in the Columbia, TN Walmart to help raise funds for the Children’s Miracle Network to support Vanderbilt Children’s Hospital. It is a HUGE charity that we support with all our hearts, so of course we had NO problem with Annabelle being their “poster” child. Suffice to say, she has a lot of Walmart friends in Columbia! Anyway, that was fun stuff too! So tonight… I have one exhausted baby!!! The whole fun nomination thing through Parents.com was, well, fun. THANK YOU by the way to whoever nominated us… you are SO sweet! Anyway, besides the fun competitive part of it, it got me thinking more about my blog, the purpose for it, and what God wants me to “do” with it. It started off as my blog to “build” a platform for my writing. For a publisher to “publish” a writer’s manuscript, it helps to have a platform, which basically means people that know you already and will buy your book when it comes out. The bigger the platform, the less of a risk it is to publish your book. You still have to have a good book, mind you, but a platform sweetens the pot if you will. So, my blog was my feeble way of trying to do that. Plus, it was fun! But then Annabelle came along and kinda hijacked my blog! My platform building was forgotten and totally unimportant. Then God did something amazing. While I was busy taking care of my daughter, updating everyone about her care and sharing what He was teaching me, my blog hits grew by, oh, let me do the math….. about 5000%? LOL. Not that I care about numbers (outside my insane need to know them due to my math brain) but my thought had always been to go back to my previous type posts once Annabelle was doing well. I no longer think that is what God wants me to do. Yet, I fear people will get bored hearing about the day-to-day goings on of Annabelle and the Phillips’ family. The “experts” tell you to have a blog about more than just yourself. Although, I like to think my blog is more about what GOD is doing and teaching, and letting that flow through to readers, than about just random facts about mundane things. I don’t have a complete answer yet. I’m praying about it a LOT. The thing is, besides tweeting my blogs, I don’t love marketing myself. I have this horrible fear of people thinking I’m doing the whole, “LOOK AT ME! SEE HOW COOL I AM” thing, and that is totally NOT what I am about. On top of that, I want to raise awareness for heart babies, for organ donation, and to do my part to help other heart families. This is a huge passion for me, and something I haven’t completely figured out how to get involved in fully. I haven’t had “discussion” time in the comments lately, and that is something I always used to do! Thought we’d try today. How competitive are YOU? Are you a “play for fun” or “play to win” kinda person… or somewhere in between? Have I totally lost your respect with my confession?? Krista,you should have no fear, because your LIFE is pointing people back to Christ. They are seeing God through you! Krista, it really doesn't matter what you blog about, your life, Annabelle, your family life, your writing, everything you do, you do unto God and I really struggle with that myself so I find you quite inspirational and enjoy lifting you and yours' up in prayer. Keep doing what you're doing, is obviously working 🙂 Happy to hear you received a gift card, that was sooo sweet! Now about you, I love your blog and love being able to keep up with Annabelle and the Phillips clan even after I moved midway across the country….I check in with you guys every few days. I also find some of your insights, comments and thoughts to be very uplifting and sometimes quite applicable to my life (and my new life as well). I especially found the previous blog about living your dream life as a SAHM very on point. Keep on blogging…..
Hooray for fun field trips! So glad to hear about these milestones. 🙂 Hopped over and voted for you! Casey, THANK YOU! That is EXACTLY what I want people to see!! Lis, thank you so much for your thoughts!! It's just been in the past year or so that I've really grasped the concept of "doing everything for God's glory…" and am still working on it!! Praying for you in your "new" life… everything going well so far???? Karen… those fieldtrips were quite fun! And THANKS for voting!!!! Who knew going to Wal-Mart could be so exciting?! Hooray! Sarah… I TOTALLY understand that. And let me point out… being competitive doesn't mean you're a sore loser. I mean, there ARE some who are (and my husband may say, sometimes, I can be as well… Usually when playing Euchre!) but I'm usually pretty adamant about losing gracefully! NO one likes a pouting loser!! It is something I am trying to teach my kids, the art of being competitive while learning how to lose with dignity. It warms my heart to hear how well things are going for you lately. Your trips to the mall and Walmart sound like such fun simply because they're the normal everyday things a happy mommy gets to do with her kiddos. And you're doing them!!! I like your blog the way it is–the real you. Yes, normal Mommy things are WONDERFUL!!! I think that is why they felt so fun!! …you do what God tells you to, but I know what you're saying. Prayers and Godspeed. Krista, your blog is so not just about you! Every time I read it I see a little bit of God's goodness and how He is present in your life … and that gives me hope and helps me to look at Him more and more. Please go on writing like you do! So happy to read about your excursions with Annabelle and to hear that things are going good. I really enjoy reading your blog. You are definitely being a witness for God and I love that even through the difficult times, His light continues to shine through you. I believe you blog helps others see Christ and His goodness. From the time my dad first got sick through his heart transplant and everything that came after that, he too wanted to share his faith in God with everyone. I think your blog is a very good thing and look forward to continuing to follow your blog and praying for your family.